Susan's TEDxColumbiaSC VIDEO! "Precious: Making a Plan for Your Precious Possessions"
"Second Life", which uses grave rubbings, vintage textiles, and personal mementoes in the creation of a small, heirloom art quilt. Susan's 5-day SECOND LIFE workshop will be taught at QSDS (Quilt and Surface Design Symposium) in Columbus, Ohio on June 3 - 7, 2019. CLICK HERE for more information and registration. Susan's 2-day HOT workshop will be taught at QSDS (Quilt and Surface Design Symposium) in Columbus, Ohio on June 8 - 9, 2019. CLICK HERE for more information and registration. 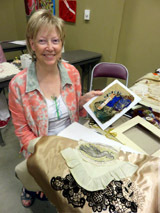 Susan's 5-day HOT workshop will be taught at the Hudson Valley Art Workshops, Greenville, NY, August 18 - 24. 2019. CLICK HERE for more information and registration. "HOT" has been taught at the Studios of Key West; the Columbia Museum of Art; the Society for Contemporary Crafts in Pittsburgh, PA; the South Carolina Artisan Center; Focus on Fibers at the Atlantic Center for the Arts in Florida; the Craft Alliance in St. Louis; The Wisconsin Museum of Quilts and Fiber Arts; Workhouse Art Center in Lorton, VA and elsewhere. The workshop is tailored to a group's individual skill levels. To schedule a workshop, please email Susan directly for more information. mouse_house@prodigy.net. Susan taught "Second Life", her grave rubbing and vintage materials art quilt class, at Arrowmont's Legacy Weekend in Gatlinburg, TN. Susan has posted the workshop outline on one of her blogs. CLICK HERE to access.